SCVHistory.com TLP2201 | Tataviam Culture | Mrs. Dolores (Cook) Biscailuz: Death Certificate, 1922. Death certificate for Mrs. Dolores Biscailuz, a daughter of Mr. Dolores Cook and Francis Olme (aka Frances). Both parents were of half-native (Los Angeles area) and half-European ancestry. 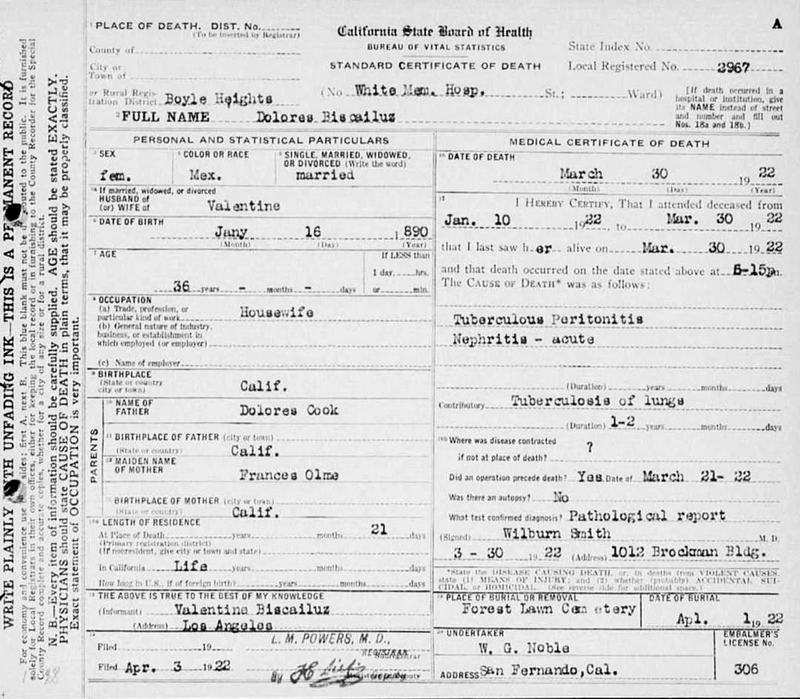 DEATH: Dolores succumbed to tuberculosis and nephritis on March 30, 1922, at White Memorial Hospital in Boyle Heights. He race is incorrectly shown here as Mexican. She was buried at Forest Lawn Cemetery with arrangements handled by W.G. Noble of San Fernando. BIRTH: Dolores was born Jan. 16, 1890, just one month before her father, Dolores Cook, was murdered in Castaic (Feb. 28, 1890). Less than three months later, her mother, Francis Olme Cook, was swindled out of their land in Castaic, where they had lived since 1882. Back in the year Dolores was born, her future father-in-law William J. Biscailuz, had been called as a character witness in the trial stemming from her father's murder, but his testimony went unheard. According to the Los Angeles Times (June 14, 1890), "W.J. Biscailuz of San Fernando met Dolores Cook seven or eight times. He was not acquainted with the people very well in the neighborhood where he resided. He was not allowed to testify as to Cook's reputation." Valentine Biscailuz's mother was Anita Lopez, sister of Tillie Lopez, who was a suspect in the death of her husband in Newhall in 1906. It was ruled a suicide. Research by Tricia Lemon Putnam. TLP2201: 9600 dpi jpeg from smaller jpeg.